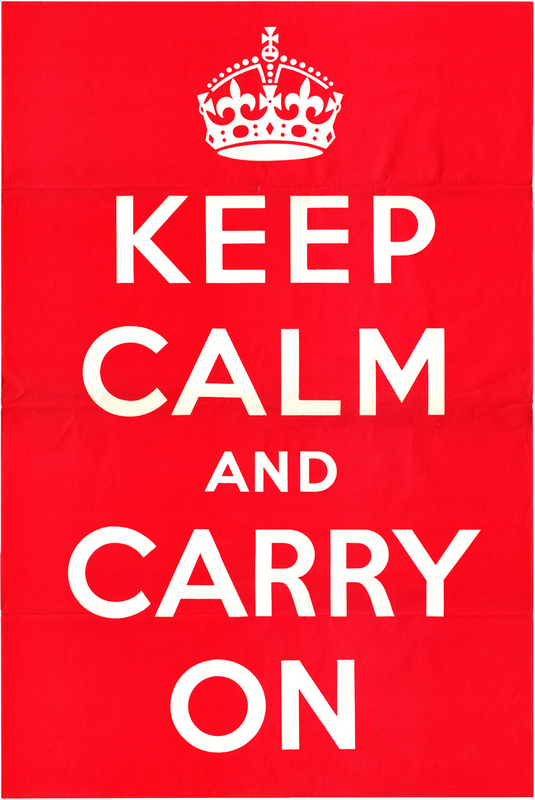 As the latest large quake to hit New Zealand was a safe distance from any communities and deep enough to not cause any severe damage it seems okay to treat it with a bit of ‘Keep Calm and Carry On’ humour. So this goes out to the many New Zealanders that are understandably a little quake-wary. “I am speaking to you from the Cabinet Room at the Beehive on the corner of Molesworth Street and Lambton Quay. This evening our ambassador handed the Earthquakes a final note stating that unless we heard from them by 11.00 pm. that they were prepared at once to withdraw their fault-lines from New Zealand and cease all shaking of our territories then a state of war would exist between us. I have to tell you now that no such undertaking has been received, and that consequently this country is at war. You can imagine what a bitter blow it is to me that all my long struggle to stop the shaking has failed. Yet I cannot believe that there is anything more or anything different that I could have done and that would have been more successful. Up to the very last it would have been quite possible to have arranged a peaceful and honourable settlement between the Earthquakes and New Zealand, but they would not have it. They had evidently made up their mind to shake New Zealand whatever happened; and although they now say they have put forward reasonable proposals which were rejected by GNS, that is not a true statement. The proposals were never shown to the GNS nor to the EQC; and although there have been a few lulls in shaking, the Earthquakes have not agreed to our terms, but instead sent their tremors to again shake New Zealand. Their actions show convincingly that there is no chance of expecting that these Earthquakes will ever give up their practice of using force to gain their will. They can only be stopped by force. Twitter and Facebook users are today, in fulfillment of their obligations, going to the aid of New Zealand, who is so bravely resisting this wicked and unprovoked attack on her people. We have a clear conscience. We have done all that any country could do to establish peace. The situation in which no word given by the Earthquakes could be trusted and no people or city (except for Auckland) could feel themselves safe has become intolerable. And now that we have resolved to finish it, I know that you will all play your part with calmness and courage. At such a moment as this the assurances of support that we have received on our Facebook news-feed are a source of profound encouragement to us. When I have finished speaking certain detailed announcements will be made on behalf of the Government. Give these your close attention. Actually apologies, it looks like we just axed our last non-commercial public service television station and TVNZ doesn’t want to interrupt ‘Big Fat Gypsy Weddings’ for these announcements. I digress..
You may be taking your part in the student army or as a volunteer in one of the branches of civil defence. If so you will report for duty in accordance with the instructions you receive. You may be engaged in work essential to the maintenance of the life of the people – in factories, in transport, in public utility concerns or in the supply of other necessaries of life. If so, it is of vital importance that you should carry on with your jobs and not give up and head over to Australia. This is of course a parody of Prime Minister Chamberlain’s announcement to the British people that they were now at war with Germany. You can hear the original here. It is a silly notion to declare war on the forces of nature, but I do think there is a bit of ‘Blitz spirit’ evident in Canterbury as communities continue to pull together to help each other endure the ongoing aftershocks, rebuild from the ruins and laugh at the out-of-towners who scurry for cover at the first hint of danger. A few people might have scurried for safety during last night’s quake – but as no damage or injury was done I think it is fine to channel the ‘Blitz Spirit’ and have a bit of a laugh at it. There is nothing to see here folks – Keep Calm and Carry On.